ANTIQUE AUTHENTIC 19TH CENTURY AFRICAN "DAN" DANCE MASK WITH REAL HUMAN TEETH! SHOWS WEAR, SIGNS OF TRIBAL USE, AND DATES FROM THE 1800'S - 1900'S! THIS OLD RARE AND UNUSUAL HAND CARVED WOODEN MASK MEASURES APPROXIMATELY 12" X 8" X 5" AND HAS A RICH OLD DARK BROWN PATINA. IT'S A LARGE OLD MASK THAT HAS BEEN "DANCED!" 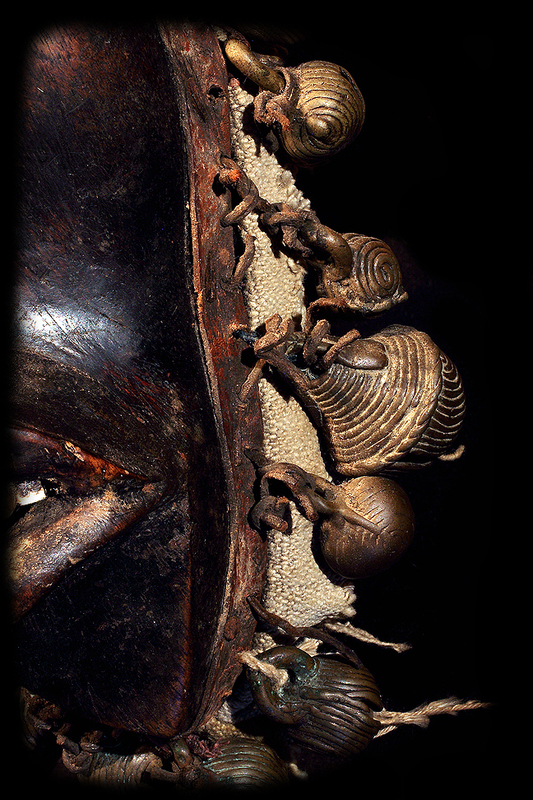 IT FEATURES VERY FINE TRIBAL CARVING IN NEAR PERFECT CONDITION, HUMAN TEETH, AND 14 ANTIQUE BRASS TRADE BELLS. IT COMES WITH A CUSTOM MADE METAL STAND THAT HAS AN OLD STICKER ON THE BOTTOM FROM BUTTERFIELD'S / BONHAMS AUCTION HOUSE IN SAN FRANCISCO THAT PUTS AN AUCTION VALUE OF $2500 - $3500 ON IT IN 1993; NEARLY 23 YEARS AGO! A COPY OF THE BUTTERFIELD'S / BONHAMS APPRAISAL WILL BE INCLUDED AND PROVIDED WITH THIS PIECE. THE VALUE MUST HAVE SUBSTANTIALLY INCREASED SINCE THAT APPRAISAL WAS DONE DECADES AGO!